Cities: Capital--Mexico City (13 million, 2000 census metro area). 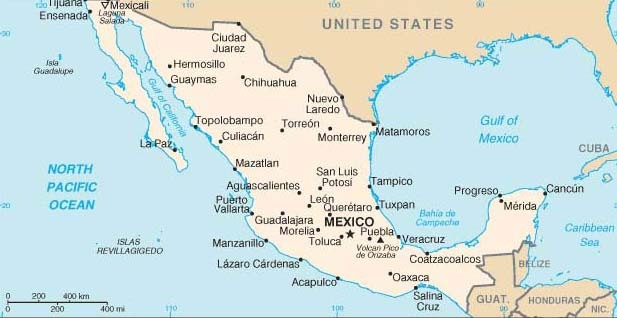 Other major cities--Guadalajara, Monterrey, Puebla, Ciudad Juarez, Tijuana, Acapulco, Merida, Leon, Veracruz. Population (2004 estimate): 105 million. Annual growth rate (2004 net): 1.2%. Religions: Roman Catholic 89%, Protestant 6%, other 5%. Education: Years compulsory--12 (note: preschool education was made mandatory in Dec. 2001). Literacy--89.4%. Health (2004 est. ): Infant mortality rate--21.69/1000. Life expectancy--male 72.18 years; female 77.83 years. Work force (2000, 39.81 million): Agriculture, forestry, hunting, fishing--21.0%; services--32.2%; commerce--16.9%; manufacturing--18.7%; construction--5.6%; transportation and communication--4.5%; mining and quarrying--1.0%. Nominal GDP (2004): $677 billion (rank in world: 12). GDP (PPP method, 2004): $1.01 trillion (rank in world: 12). Per capita GDP (2004): $6,517 (rank in world: 51). Per capita GDP (PPP method, 2004): $9,774 (rank in world: 54). Annual real GDP growth: (2005 est.) 3.0%; (2004) 4.4%; (2003) 1.3%; (2002) 0.9%; (2001) -0.3%; (2000) 6.6%; (1999) 3.7%. Avg. real GDP growth (1999-2003): 2.1%. Inflation rate: (2005 est.) 3.2%; (2004) 5.2%; (2003) 4.0%; (2002) 5.0%; (2001) 6.4%; (2000) 9.5%; (1999) 16.6%. Agriculture (4% of GDP): Products--corn, beans, oilseeds, feed grains, fruit, cotton, coffee, sugarcane, winter vegetables. Industry (24.0% of GDP): Types--manufacturing, energy, construction. Services (72% of GDP): Types--commerce and tourism (20%), financial services (12%), and transportation and communications (10%). Trade (Goods): Exports (2004)--$189 billion. Imports (2004)--$197 billion. Exports to U.S. (2004)--$165 billion (87% of total). Imports from U.S. (2004)--$110 billion (55% of total). Major markets--U.S., EU, Japan, Canada, China. Education is one of the Government of Mexico�s highest priorities. The education budget has increased significantly in recent years; funding in real terms for education has increased by almost 25% over the last decade. Education in Mexico also is being decentralized from federal to state authority in order to improve accountability. Although educational levels in Mexico have improved substantially in recent decades, the country still faces daunting problems. Education is mandatory from ages 6 through 18. In addition, the Mexican Congress voted in December of 2001 to make one year of preschool mandatory, which went into effect in 2004. The increase in school enrollments during the past two decades has been dramatic. By 1999, 94% of the population between the ages of 6 and 14 were enrolled in school. Primary, including preschool, enrollment totaled 17.2 million in 2000. Enrollment at the secondary public school level rose from 1.4 million in 1972 to 5.4 million in 2000. A rapid rise also occurred in higher education. Between 1959-2000 college enrollments rose from 62,000 to more than 2.0 million. Highly developed cultures, including those of the Olmecs, Mayas, Toltecs, and Aztecs existed long before the Spanish conquest. Hernando Cortes conquered Mexico during the period 1519-21 and founded a Spanish colony that lasted nearly 300 years. Independence from Spain was proclaimed by Father Miguel Hidalgo on September 16, 1810. Father Hidalgo�s declaration of national independence, known in Mexico as the �Grito de Dolores�, launched a decade long struggle for independence from Spain. Prominent figures in Mexico�s war for independence were Father Jose Maria Morelos; Gen. Augustin de Iturbide, who defeated the Spaniards and ruled as Mexican emperor from 1822-23; and Gen. Antonio Lopez de Santa Ana, who went on to control Mexican politics from 1833 to 1855. An 1821 treaty recognized Mexican independence from Spain and called for a constitutional monarchy. The planned monarchy failed; a republic was proclaimed in December 1822 and established in 1824. Throughout the rest of the 19th century, Mexico�s government and economy were shaped by contentious debates among liberals and conservatives, republicans and monarchists, federalists and those who favored centralized government. During the two presidential terms of Benito Juarez (1858-71), Mexico experimented with modern democratic and economic reforms. President Juarez� terms, and Mexico�s early experience with democracy were interrupted by the Habsburg monarchy�s rule of Mexico (1864-67), and by the authoritarian government of Gen. Porfirio Diaz, who was president during most of the period between 1877 and 1911. Mexico�s severe social and economic problems erupted in a revolution that lasted from 1910-20 and gave rise to the 1917 constitution. Prominent leaders in this period--some of whom were rivals for power--were Francisco I. Madero, Venustiano Carranza, Pancho Villa, Alvaro Obregon, Victoriano Huerta, and Emiliano Zapata. The Institutional Revolutionary Party (PRI), formed in 1929 under a different name, emerged as a coalition of interests after the chaos of the revolution as a vehicle for keeping political competition in peaceful channels. For 71 years, Mexico�s national government was controlled by the PRI, which won every presidential race and most gubernatorial races until the July 2000 presidential election of Vicente Fox Quesada of the National Action Party (PAN). The 1917 constitution provides for a federal republic with powers separated into independent executive, legislative, and judicial branches. Historically, the executive is the dominant branch, with power vested in the president, who promulgates and executes the laws of the Congress. The Congress has played an increasingly important role since 1997 when opposition parties first made major gains. The president also legislates by executive decree in certain economic and financial fields, using powers delegated from the Congress. The president is elected by universal adult suffrage for a 6-year term and may not hold office a second time. There is no vice president; in the event of the removal or death of the president, a provisional president is elected by the Congress. The Congress is composed of a Senate and a Chamber of Deputies. Consecutive re-election is prohibited. Senators are elected to 6-year terms, and deputies serve 3-year terms. The Senate�s 128 seats are filled by a mixture of direct-election and proportional representation. In the lower chamber, 300 deputies are directly elected to represent single-member districts, and 200 are selected by a modified form of proportional representation from five electoral regions. The 200 proportional representation seats were created to help smaller parties gain access to the Chamber. The judiciary is divided into federal and state court systems, with federal courts having jurisdiction over most civil cases and those involving major felonies. Under the constitution, trial and sentencing must be completed within 12 months of arrest for crimes that would carry at least a 2-year sentence. In practice, the judicial system often does not meet this requirement. Trial is by judge, not jury, in most criminal cases. Defendants have a right to counsel, and public defenders are available. Other rights include defense against self-incrimination, the right to confront one�s accusers, and the right to a public trial. Supreme Court justices are appointed by the president and approved by the Senate. Mexico maintains an embassy in the United States at 1911 Pennsylvania Ave. NW, Washington, DC 20006 (tel. 202-728-1600). Consular offices are located at 2827 - 16th St. NW, 20009 (tel. 202-736-1012), and the trade office is co-located at the embassy (tel. 202-728-1686). Besides its embassy, Mexico maintains 48 diplomatic offices in the U.S. Consulates general are located in Chicago, Dallas, Denver, El Paso, Houston, Los Angeles, Miami, New Orleans, New York, San Antonio, San Diego, and San Francisco; consulates are (partial listing) in Atlanta, Boston, Detroit, Philadelphia, Seattle, St. Louis, and Tucson. On July 2, 2000, Vicente Fox Quesada of the opposition "Alliance for Change" coalition, headed by the National Action Party (PAN), was elected president, in what are considered to have been the freest and fairest elections in Mexico�s history. Fox began his 6-year term on December 1, 2000. His victory ended the Institutional Revolutionary Party�s (PRI) 71-year hold on the presidency. The introduction of proportional representation has made the bicameral Mexican Congress a more pluralized institution. Currently, no party holds an absolute majority in either house. As competition among Mexico�s three major parties in Congress increases, the legislative branch is playing an increasingly important role in Mexico�s democratic transformation. Mexico�s armed forces number about 225,000. The army makes up about three-fourths of that total. The navy is a completely autonomous cabinet agency and as such there is no joint chief of staff position. Principal military roles include national defense, narcotics control, and civic action assignments such as search and rescue and disaster relief. Mexican military and naval forces provided disaster assistance to the U.S. in the aftermath of Hurricane Katrina, which struck Louisiana and Mississippi in August 2005. U.S. relations with Mexico are as important and complex as with any country in the world. A stable, democratic, and economically prosperous Mexico is fundamental to U.S. interests. U.S. relations with Mexico have a direct impact on the lives and livelihoods of millions of Americans--whether the issue is trade and economic reform, homeland security, drug control, migration, or the promotion of democracy. The U.S. and Mexico are partners in NAFTA, and enjoy a rapidly developing trade relationship. In March 2005 Mexico formed the Security and Prosperity Partnership (SPP) with the U.S. and Canada. The SPP contemplates trilateral and bilateral initiatives to develop new avenues of cooperation that will enhance security, competition, and economic resilience. There is frequent contact at the highest levels. The Presidents� meetings have included the Asia-Pacific Economic Cooperation Summit in Bangkok in October 2003; President Bush�s visits to Monterrey in January 2004 (Summit of the Americas) and March 2002; his April 2001 visit to Guanajuato; President Fox�s state visit to the U.S. in September 2001, and his meeting with the President at Crawford, Texas in March 2004. The two Presidents met again in Crawford in March 2005, along with Canadian Prime Minister Martin, to launch the Security and Prosperity Partnership for North America, a trilateral initiative to encourage even greater commercial activity while enhancing security for the region. A strong partnership with Mexico is critical to combating terrorism and controlling the flow of illicit drugs into the United States. In recent years, cooperation on counter-narcotics and Mexico�s own initiatives in fighting drug trafficking have been unprecedented. The U.S. will continue working with Mexico to help ensure that Mexico�s cooperation and anti-drug efforts grow even stronger. The U.S. and Mexico continue to cooperate on narcotics interdiction, demand reduction, and eradication. As the number of people and the volume of cargo crossing the U.S.-Mexico border grow, so, too, does the need for coordinated infrastructure development. The multi-agency U.S.-Mexico Binational Group on Bridges and Border Crossings meets twice yearly to improve the efficiency of existing crossings and coordinate planning for new ones. The 10 U.S. and Mexican border states have become active participants in these meetings. An 1889 convention establishing the International Boundary Commission, reconstituted by the Water Treaty of 1944 as the International Boundary and Water Commission, United States and Mexico (IBWC). The IBWC has settled many difficult U.S.-Mexico boundary and water problems, including the regularization of the Rio Grande near El Paso through the 1967 Chamizal settlement. The IBWC divides the use of international waters, builds and operates water conservation and flood control projects, and constructs and maintains boundary markers on the land boundary and on international bridges. In recent years, the IBWC has worked to resolve longstanding border sanitation problems, to monitor the quantity and quality of border waters, and to address water delivery and sedimentation problems of the Colorado River. Current issues include Mexico�s water debt to the U.S. on the Rio Grande, ecology of the Colorado River Delta, shared wastewater treatment facilities in San Diego/Tijuana, and the asserted impact on Mexican groundwater sources which may be caused by the lining of the All-American Canal. A series of agreements on border health (since 1942), wildlife and migratory birds (since 1936), national parks, forests, marine and atmospheric resources. In July of 2000, the U.S. and Mexico signed an agreement to establish a binational Border Health Commission. The Border Health Commission held its inaugural meeting in November 2000. The 1983 La Paz Agreement to protect and improve the border environment and Border XXI, a binational, interagency planning program, begun in 1996, to address environmental, natural resource, and environmental health concerns in the border area. The U.S. and Mexico have initiated discussion to develop a new border environmental program that will build on the progress of Border XXI while enhancing decentralization and stakeholders� involvement. A November 1993 agreement between the U.S. and Mexico, also related to NAFTA, establishing the Border Environment Cooperation Commission (BECC) which works with local communities to develop and certify environmental infrastructure projects such as wastewater treatment plants, drinking water systems, and solid waste disposal facilities. The sister organization, the North American Development Bank (NADBank), uses capital and grant funds contributed by partner governments to help finance border environmental infrastructure projects certified by the BECC. The U.S. and Mexico are in the process of combining the Board of Directors from both the BECC and the NADBank into a single institution. The resulting single board will streamline the project certification cycle and provide an increase in environmental infrastructure. The embassy and the 22 U.S. Consulates General, Consulates, and consular agents provide a range of services to American students, tourists, business people, and residents throughout Mexico.